Lake Pontchartrain Causeway is a system of two parallel bridges that connect both ends of Lake Pontchartrain. 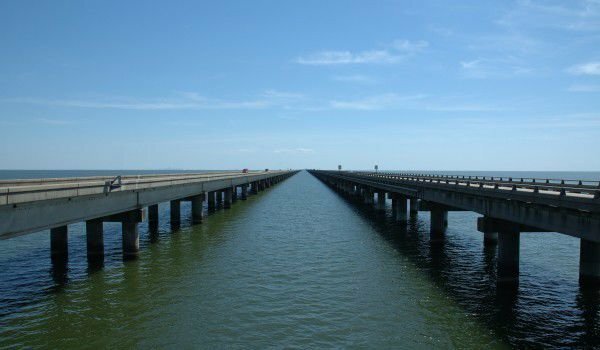 At this stage the Lake Pontchartrain Causeway with its length of 38.4 km is considered to be the longest bridge in the world. In the final stage is the construction of the facility over the sea between Hong Kong and Macao, which upon completion will be longer than 50 km. Thus the bridge (Qingdao Haiwan Bridge), connecting the southern province of Guangdong to Hong Kong and Macao will dethrone Lake Pontchartrain Causeway for the first place. The longest existing bridge connects the shores of Lake Pontchartrain in Southeast Louisiana. To move all the way from the one end to the other, the drive takes about 25 minutes, if, of course, you respect the designated speed limits. Currently Lake Pontchartrain Causeway is considered the fifth or sixth longest bridge in the world. Bang Na Expressway in Bangkok reaches a length of 54 km, but it crosses the water space in a fraction of its length. Bridges connect the Lake Pontchartrain south coast in Metairie, Louisiana, which is part of New Orleans and the north coast town in Mandeville. The first bridge over Pontchartrain was completed in 1956 and is built entirely of subassemblies, 9500 in number, each of which covers a hole 17 meters in length and width of 10 meters. The second bridge was built under the first and is open for operation in 1969 and is also made of prefabricated elements. Items for the entire Lake Pontchartrain Causeway are produced in a temporary undertaking on the lake, and are transported and installed using the vessels. The idea of building bridges on Lake Pontchartrain dates from the early 19th century, Bernard de Marigny, founder of Mandeville, had ferry services to the practice in 1930 from one to the other end of the lake. The original idea, proposed in 1920, is to build artificial islands on Lake Pontchartrain, to be connected together by a small bridge. Funds for their construction would come from the selling of plots in the artificial drought. In 1948 Louisiana law appointed a commission to build Lake Pontchartrain Causeway. For the project manager is appointed James E. Walters. The original bridge had two lanes that are put into operation in 1956, and the entire project amounts to $ 37, 000, 000. A parallel two-lane span, 1/100th of a mile (15 m) longer than the original, second bridge was opened on May 10, 1969 alongside the first, and is 15 meters longer than the original. Construction of the last bridge of Lake Pontchartrain Causeway costs about $26 million. Lake Pontchartrain Causeway has always been a paid bridge. Until 1999, the fees were collected by both sides, but then the payment is transferred only on the south side. Bilateral coupon is worth $ 3 and 1.50 in one direction. Over 30 000 cars pass daily on the Lake Pontchartrain Causeway.